Q. Can I order a version on CD? A. File-Saver is a POWERFUL undelete tool! It enables you to recover and undelete lost files, documents and photos, even months after you deleted them. It doesn't matter whether you've accidentally emptied the Recycle Bin, or your computer was attacked by a virus. If your files have been deleted, they can usually be undeleted! A. When files are deleted on your computer, they never really disappear. Instead, only the first part of the file is removed - everything else remains intact until its overwritten by other information. File-Saver works by scanning your disk for those partially deleted files, then uses its own built-in intelligence to piece everything back together for you. A. Anything you like! 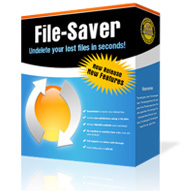 File-Saver can undelete any deleted or lost file from your computer. That includes photographs, important documents, system files, computer programs and more. A. Almost DEFINITELY! File-Saver works on any Windows computer, including Windows 95, Windows 98, Windows NT, Windows 2000, Windows ME, Windows 2003, Windows XP, Windows Vista and Windows 7. A. Absolutely NOT! While competing products charge per file recovered, File-Saver allows you to recover and undelete an unlimited number of files from an unlimited number of drives. There's NO limit with File-Saver! A. Unlike some of our competitors, we do NOT charge a membership fee or per-file-royalty for recovering your documents. Our undelete software is sold at a flat, one-time fee, which includes a support package, documentation and a full introductory walk-through! A. If you're concerned about your privacy, we recommend using a secure deletion tool to remove all undelete information from your computer. We recommend Secure-Delete, the permanent file deletion tool. A. We have a full support department ready to help you, plus we provide a full walk-through guide upon purchase. If you require support at ANY time, simply contact us via our dedicated support site, myHelpHub.com. We promise to answer all queries in under one business day and our average response time is just four hours. We also routinely provide online chat, too! A. Absolutely! Our CD version costs just $34.95 - which includes FREE international shipping and handling! We'll send you a professionally-pressed version of File-Saver on CD-ROM, in a hi-tech ejector CD case - PLUS we'll also mail you instant download links so you can get started straight away. Want the CD version? Simply CLICK HERE to buy now for just $34.95!